Secure or Insecure Attachment in Infancy Largely Shapes Who We Are Today! Secure attachment or insecure attachment? Our instant interpretation leaves little doubt that secure attachment must be 'better' than insecure. So far, so good ... but what do those concepts really mean and what is their relevance? 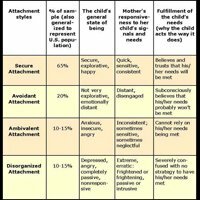 Well, let's start with the relevance of these attachment styles, because it's quite a biggie! ... for the rest of our lives! 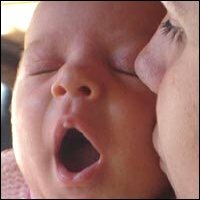 ... but numerous studies of the psychology of children show that the 'quality' of infant attachment – the way our mother responded to our need for comfort, security, attention etc. 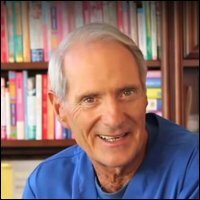 - is paramount in the shaping of our personality and how we deal with relationships. Yes, it may seem quite overwhelming, and for some, even unfair that our mother's attention, responsiveness and sensitivity have such a strong influence on who we become. For instance, studies of Western families' adoption of Romanian orphans after the fall of Ceausescu demonstrated that proper love and care can heal a lot. When these kids were in their teens, 70% of them were said to display no severe insecure attachment problems (which does not mean that there weren't insecure issues of attachment at all). That is quite remarkable considering that as orphans they probably had little or no opportunity to form this important early attachment. 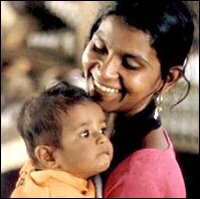 According to attachment theory, infants and young children communicate attachment behavior to get their mother's attention or to be in her proximity. A mother's consistent response to these signals is necessary for the infant's physical survival and healthy psychological development. Insecure and secure attachment refer to specific attachment behavior patterns that the infant shows, typically when being under some form of stress. These patterns have been largely shaped by the mother’s sensitive responsiveness (secure attachment) – or lack or inconsistency of responsiveness (insecure attachment). 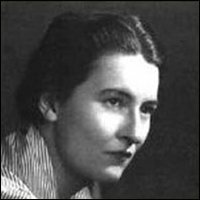 Back in the 1960's developmental psychologist Mary Ainsworth developed a lab experiment called the Strange Situation Protocol. In this experiment she put a mother and her toddler in an unfamiliar playroom along with a female stranger. Then the mother was to leave the room, leaving the child alone with the stranger. After a few minutes the mother would return and reunite with her child. 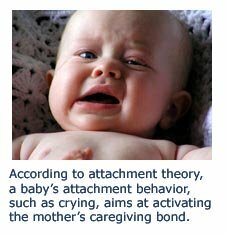 These actions allowed Mary Ainsworth to observe separation and reunion behavior which would demonstrate whether a toddler was securely attached or displayed one of three attachment styles characterized by insecurity: avoidant attachment , ambivalent attachment or disorganized attachment. 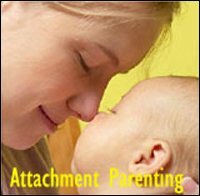 To put it very shortly, secure attachment can be achieved by quickly and consistently responding to your baby's signals and thereby fulfilling his or her needs! What an infant or child 'needs' from his or her parents are, among other things, attention, physical contact, presence, understanding, acceptance, comfort, a sense of security etc. Insecure attachment is logically the result of the opposite situation - ignoring or inconsistently fulfilling the infant's needs. 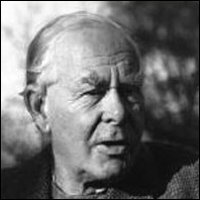 If the basic existential needs are met, the child will be 'free': He or she will feel secure to explore the world, and consequently develop skills and feel the mastery of them, which builds self esteem etc. 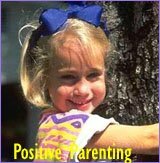 The goal of attachment parenting and positive parenting is in fact to create secure attachment between mother or primary caregiver and child. 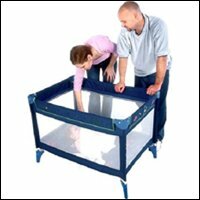 If the infant's needs are not met, and as a consequence, the child has formed an insecure attachment to his or her primary parent, life will obviously prove more difficult and challenging in several areas (some of these will be listed further down). Both long term studies of the psychology of children - and a simple use of logic - tell us that secure attachment provides positive effects: A happy child has a high chance of a happy childhood and later, a happy life. o	The child has learnt that his or her needs will be met. Therefore they will expect help to be available and will therefore more easily reach out for it. o	The sensitive responses to and acceptance of the child's attachment behavior reflect back on the child: the positive way the parent sees and treats the child becomes the way the child sees and treats him- or herself. o	The mother's consistent, affectionate care-giving has paved the way for an ability to build and maintain long-term friendships and strong, healthy romantic relationships. Intimacy, trust and positive expectations are second nature. o	A combination of hope, a positive outlook on life and good self esteem along with the ability to reach out for help and expect support, help securely attached children to cope better and faster with emotional challenges, stress and trauma. 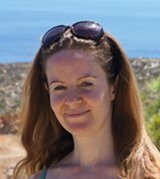 o	Children with secure attachment histories have more 'ego resiliency': They are good at adapting to new situations and controlling their impulses and emotions. o	As an infant, the child has learnt that attachment behavior – or emotional expressions such as crying – is no good. It has no positive effect! So the child may not have developed much emotional awareness and may have a tendency to hide his or her feelings and not express negative emotions. o	As a defence mechanism, an avoidant child will tend to not reach out for help because of his or her belief that no one will respond constructively. o	Because of their 'distant' nature and restricted emotional availability among other things, it is often difficult to build and maintain long-term relationships – both in relation to friends and partners. o	Avoidant adults may tend to bury themselves in work a as way to avoid dealing with people and relations. o	Compared with securely attached children, children with ambivalent insecure attachment tend to be less enthusiastic in their endeavours and experience and express more frustration and anger. 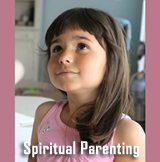 o	Because of the mother’s inconsistent responses, the child is may be confused about his or her self image and often feels misunderstood or undervalued. o	Because of the mother's sometimes sensitive, sometimes insensitive responsiveness, the child tends to be anxious by nature, concerned with and afraid of 'losing' the sense of 'connectedness' or union. o	This concern tends to be carried into love relationships and shows itself as obsession or strong jealousy. o	This concern may also make work life complicated in terms of for instance jealousy, desire for appreciation etc. - A Cause For Concern! The category of disorganized insecure attachment in infancy is still quite new and is still being studied further to learn more about it. One thing that researchers found was that when compared with the other two attachment categories (the insecure ones), children with disorganized attachment concerns are at more risk of developing aggressive behavior problems, which might already surface at the age of about five. Please note that the above attachment styles and their outcome show the general picture, which means that individual exceptions are not included. Therefore, use your critical eye! Don't take anything, any postulate, for granted. Back to the top of this page about Secure or Insecure Attachment in Infancy Largely Shapes Who We Are Today!